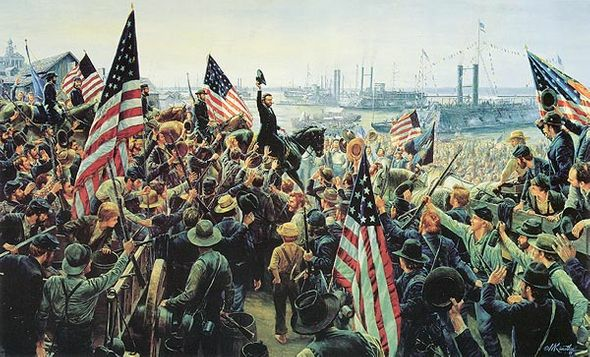 Mort Kunstler Handsigned and Numbered Limited Edition Giclee Print on Canvas:"Glorious Fourth, The Masterpiece Collection"
One of the greatest military victories in the history of the Western Hemisphere took place with the surrender of Vicksburg on July 4, 1863, one day after the conclusion of the Battle of Gettysburg. Over 30,000 troops surrendered, along with more than 60,000 guns and almost 200 cannons. I try to paint subjects that have never been done before. When I became familiar with the Vicksburg siege, I felt this episode was excellent material for a painting. The scene shows Grant riding down the Old Landing to meet and congratulate Admiral David Porter, commander of the river fleet, aboard the flagship, the U.S.S. Benton. There were an estimated 8,000 Union troops on hand, cheering, waving flags and celebrating this great victory, as well as the Fourth of July. The surrender took place about 10:00 a.m. The key to a picture this complex is to capture the excitement and celebration, and still have the eye travel to the center of interest, Grant. He must also be immediately recognizable. I hope the painting succeeds on these counts. Extensive research involved consultations with historians, studying of maps, books, and photographs, and records of battle, as well as a trip to the U.S. Navy Memorial Museum in Washington, D.C. I think following points would be of interest to the viewer. Grant, in his typically informal dress, without swordbelt, and riding his favorite mount, Cincinatti, waves to the crowd. In his party and immediately behind him is General John D. Stevenson, followed by General James McPherson, and General John C. Logan. The likenesses were a difficult problem because I could find no photographs that existed of any of them in the positions I wanted them in. Research revealed the units that were present and I have shown some of them by the lettering on the battle flags. Regiments from Indiana, Wisconsin, Illinois and Minnesota are represented. There was a debate between the 45th Illinois and the 4th Minnesota as to who was the first unit into Vicksburg. Both of these unit flags show prominently. The flag in the foreground is a headquarters flag. Many of the soldiers are in shirtsleeves, although orders called for full uniform and no drinking. There is one saying that I have always remembered about the Civil War soldier. "He obeyed a reasonable order, not because it was an order, but because it was reasonable." I have been to Mississippi in July! In the extreme foreground, left center and in the cart, are empty buckets and barrels, symbolic of the lack of food and supplies that forced the Confederates to surrender after a hard siege of twelve weeks. A few sailors can be seen in the crowd, two immediately behind Cincinatti. The few civilians present are women, children and old men like the farmer on the wagon. Behind them in the upper left corner of the picture, is the Warren County Courthouse, flying a newly hung Union flag. The courthouse, the only building in the painting that is still standing, is now a museum. As we look to the background of the painting, along the river, we are facing southwest. The flagship of the river fleet, the U.S.S. Benton, is the one closest to us on the far right. The colorful signal flags spell out congratulations and greetings described in History of the Flag of the United States of America by George Henry Preble, Rear Admiral U.S. Navy, published in 1880. Admiral Porter is seen on the top deck, extreme left, on the steps up to the pilothouse. All ships in the background, rams, monitors, converted riverboats, etc. are based on actual boats that were at the battle. Many of the ships are firing blank shots as a salute to Grant as he makes his way through the crowd. The Glorious Fourth is by far the most time consuming and difficult painting I have ever done. I hope everyone enjoys looking at it half as much as I enjoyed finally finishing it. An interesting footnote is that I finished this painting on July 4, 1989 exactly 126 years to the day of the event I am portraying. It was truly a Glorious Fourth for me!